Fire up the grill for this BBQ Turkey Cheeseburger. 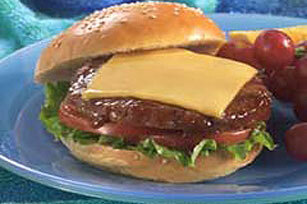 Perfect for a fun summer night, this BBQ Turkey Cheeseburger take just 30 minutes to make. Mix turkey and dry seasonings just until blended; shape into 4 (1/2-inch-thick) patties. Grill 7 to 9 min. on each side or until done (165�F), brushing occasionally with barbecue sauce. Top burgers with 2% Milk Singles; grill 1 min. or until melted. Fill buns with lettuce, tomatoes and burgers. Serve with your favorite fresh fruit, such as red grapes. Prepare using your favorite flavor of KRAFT or BULL'S-EYE Barbecue Sauce. Shape turkey mixture into patties as directed; cook in skillet on medium heat 7 to 9 min. on each side or until done (165°F). Continue as directed.